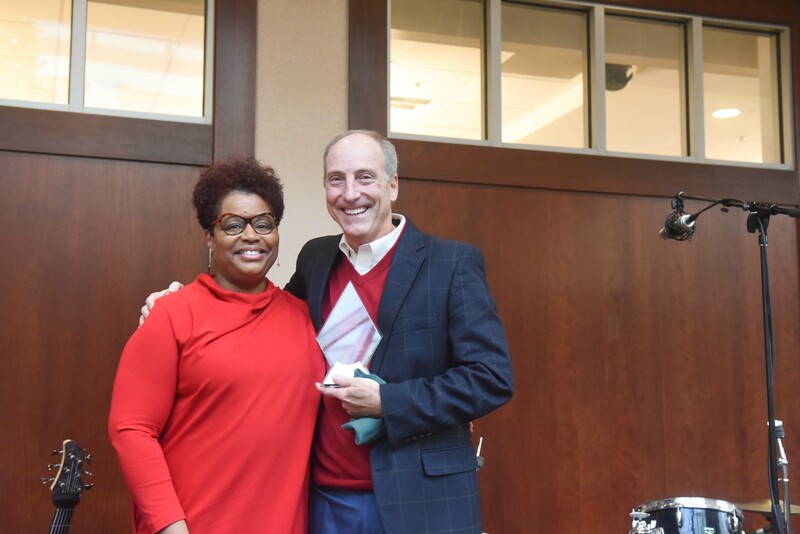 Director of Communications and long-time Belmont employee Greg Pillon was named as the 2018 Gabhart Award Recipient at Belmont’s annual Staff Christmas Breakfast, held on Thursday, December 6 in the Maddox Grand Atrium. Named in honor of the late Dr. Herbert C. Gabhart, who served Belmont selflessly for 50 years as President and Chancellor, the Gabhart Award is the highest honor presented to a staff person and honors a member of the Belmont community who demonstrates significant achievements, commitment and service to the University. For the last 18 years, Pillon has served Belmont in the Office of Communications where he oversees the office’s operations, including the Copy Center. Responsible for all internal and external communications, media relations, crisis communications and publications, Pillon manages the Office of Communication’s strategy and direction. This year’s Gabhart Finalists also included Steve Barrick, Athletics and Patsy Peach, Social Work. Past Gabhart Award winners include Don Purdy, Betty Wiseman, Sarah Cates, Gary Hunter, Joan Eakin, Bonnie Wagonfield and Anthony Donovan.